CRYSTALS v14.21 installer is available to download for the Windows platfom. Constraints (List 12), restraints (List 16) and manually omitted reflections (List 28) are appended to the CIF for easy reference. Punch for list 1 is now possible. Included slant 2Fo-Fc maps on the menu. Fixed 2 bugs in #Perhydro: phenyl rings now work again and addition of H to disordered components is fixed. New list 9 stores parameter standard uncertainties from last cycle of least squares. New script for reading general CIFs from diffractometers. New script for centering structures in cells. Reduced number of questions during reading back of Superflip solutions. New script for editing f’ and f”. The results have just been announced for the latest round of applications to the John Fell Oxford University Research Fund. Our proposal for funding for a temperature controlled Peltier stage microscope with polarizing filters for the study of solid-state phase transitions in crystalline materials was successful. Polarized light allows the ready detection of discontinuous changes in the anisotropy of a material during heating or cooling since discontinuity in any property is symptomatic of a phase change (an order-disorder transformation, a change in crystal symmetry, or the formation of a completely new phase). Studying such phase changes using a temperature controlled stage can assist in optimising conditions for obtaining a given form of a material, and also leading to an understanding the nature or mechanism of the transformation. 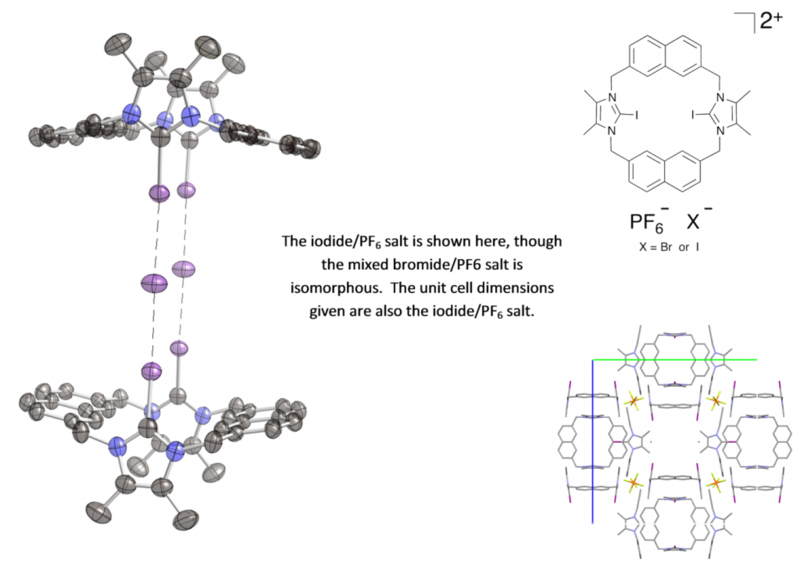 Both the mixed bromide/PF6 and mixed iodide/PF6 salt of this bis-iodoimidazolium macrocycle crystallize in the unusual cubic spacegroup I m -3 (there are currently only six organic structures in this spacegroup in the CSD). The macrocycle binds anions strongly and selectively in competitive methanol/water solvent mixtures, with anions being bound solely by halogen-bonding interactions. In the solid state, the both the bromide and iodide salts of the macrocycle exist as a dimer, with two macrocycles each pointing at two halide anions. Experiments are being undertaken to see if this arrangement occurs in solution.